Crafting is a valuable skill in RuneScape, giving you the ability to make pottery, leather, craft your own jewelry and Battle Staffs, make vials and orbs from hot sand, as well as other helpful uses. Pottery making is a great way to begin crafting because it gives a nice amount of experience and it's fairly straightforward. Its main purpose is to help you with cooking, since the things you make with it are used to hold ingredients. Start by killing some Cows near Lumbridge, gathering their cow hides. You'll also need some money, including 10gp to cross the toll gate, if you haven't done the Prince Ali Rescue quest. Depending on your level (and what you want to make) Soft Leather costs 1gp, and Hard Leather costs 3gp each. You'll also need a Needle (1gp) and some Thread (1gp), which lasts 4 leather items. 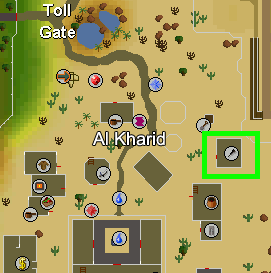 The Tanner can be found in the west part of Al Kharid, so speak to him and choose the type and number of leather you wish him to make from the graphical menu. Now use your needle with the leather and choose the item you wish to craft. Studded Leather - Can be worn on the free world, but can only be made in the Member's land. First craft either a Leather Body or some Chaps. Smith some studs from a steel bar, and then use those studs with the leather item. If you're a Member, you'll have the ability to wear Snakeskin Armor, which is slightly stronger than regular leather. Crafting this type of armor is just like making regular leather, and you'll need some Thread and a Needle. Head to the village of Tai Bwo Wannai, located on the island of Karamja and kill some Bush Snakes to obtain their snakeskins. 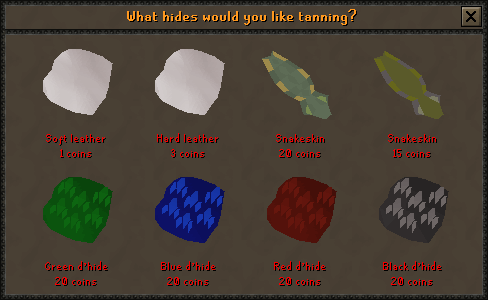 They must then be tanned by a Tanner for 15gp each, and then you can craft them into armor. Blue - Level 111 Blue Dragons in the Hero's Guild and the Taverley Dungeon. Vambraces require 1 Dragonhide, Chaps require 2 pieces, and Bodies require 3. After getting a bit more advanced at the art of crafting, it's about time to move onto jewelry. You can get a huge profit from crafting jewelry, and many of the things you can make give lots of experience. You'll need to smelt bars of either Silver or Gold in a furnace, depending on what you want to make. Silver Bars are used to make Holy Symbols and Unholy Symbols, while Gold is used to make Rings, Necklaces and Amulets. After making your metal bars, use the bar with the furnace to smelt it and fill the mould. To start making jewelry, use a bar of either silver or gold (depending on what you wish to make) with the furnace. A graphical screen will come up with choices of what you can make. Objects that you can craft will be colored in, while things you can't make will be gray. Opals, Jades, and Red Topaz can become a Crushed Gemstone if you fail to cut them. You will still receive a small amount of experience. You can also crush them using a Hammer. Ring of Slaying: Before you can craft this ring, you must purchase the knowledge to do so for 300 Slayer Points from any Slayer Master. This ring requires a Gold bar and an Enchanted Gem (purchased from a Slayer Master). Bracelets are similar to other jewelry in the way that they can be enchanted using a magic Enchant spell to give them special effects when worn. These can be equipped and are worn in the gloves spot. Please see the Enchantment section in the Magic guide for further information on the different effects of bracelets. Silver items require a mould for the object, as well as a Silver Bar. Just use a Silver Bar with a Furnace while carrying the mould and you'll be able to choose what you wish to make from a list of items. These necklaces are powerful icons, crafted to honor the God Saradomin. You'll need a Holy Symbol Mould to craft one. When it's blessed and equipped it will add +8 to your Prayer equipment bonus, resulting in a slower drain rate for your prayers. These items will give the same bonus to your prayer as a Holy Symbol, but they are Members-Only. To make one, you'll need an Unholy Mould which can be obtained from the Spirit of Scorpius in the graveyard north of the Observatory after completing the Observatory Quest. These items are used in the Nature Spirit quest and are Members-Only. They require a Sickle Mould. For more info about blessing Holy and Unholy Symbols, check the Prayer Guide. These items are used in Runecrafting and require a Tiara Mould. Just craft the Tiara as you would make any other Silver item, and then bring it to the Runecrafting Altar of your choice, along with the same type of Talisman. Then just use the Tiara on the Talisman to enchant it into that type of Talisman. You can now wear it and have access to that Temple! 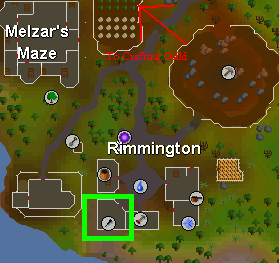 Check out the Runecrafting guide for more info. There are several things you'll need to string before you can use them, including Amulets, Holy & Unholy Symbols, as well as bows. To string Amulets and Symbols, buy a pair of Shears from your local General Store. Use these on a sheep to get wool, and then spin the wool on a Spinning Wheel to get a ball of wool. Spinning wheels can be found in Lumbridge Castle, the Barbarian Village, Falador and Seer's Village, to name a few places. Use the ball of wool with the Amulet or Symbol to string it. To string a bow, you'll need to pick some Flax from around Camelot Castle and spin it on a Spinning Wheel to make a Bow String. This can then be used with an unstrung bow to make it into a useable bow. You are able to spin player-grown Magic Tree Roots into Magic Strings for use on a Nature Amulet. To do this, just chop down a Magic Tree and use a Spade on the stump. You will dig out the roots, which can be spun on a spinning wheel into Magic String which can be used to string Nature Amulets (used in Farming to check on your crops). Sarah's Farmhouse, located south of Falador. Elf Camp, located in the northwest corner of Tirannwn. To use a Loom to weave an item, use one of the required materials on the Loom and select the item you wish to make. Vegetable Sacks hold ten pieces of produce, while Fruit Baskets hold five. Seaweed Nets are used to collect Seaweed. Each net can hold up to ten pieces of Seaweed. When a player picks up a piece of Seaweed up from the ground, it goes directly into the net. Players can also left-click the net to fill it up with Seaweed from their inventory. The Strip of Cloth is used during the Regicide quest. Milestone Capes are special capes which can be weaved on a Loom. these capes are purely cosmetic items, and do not offer any equipment bonuses or effects. There are nine different Milestone Capes available, and each cape becomes available to wear once a player reaches a certain level in all his or her skills. For example, to wear Milestone Cape (30), all of a player's skill levels must be at least 30. Players only need to have the required Crafting level to weave a Milestone Cape. The Player-Owned House cape rack can store one of each Milestone Cape. Members have the ability to make glass items from sand. It's a great way to build your experience, since everything you need to get started can be found on the island and you don't need to travel from place to place to find the things you need. But first we should make a quick shopping list. Firstly, just put all of your weapons and armor into the bank since you can't bring them to Entrana. Buy a bucket or 2 from the General store to hold your sand. If you don't want to wait for seaweed to wash up on the beach of Entrana, you can fish for some with a Big Net in Catherby. There is also a respawn on the northern side of the river that runs through Shilo Village. Go back to the house where you found the glass-blowing pipe and cook the seaweed over the range to get some soda ash . Fill your bucket of sand up from the sand pit located conveniently near the range and furnace. It's just south of the range and south-west of the furnace. Use the bucket of sand with the furnace to get some molten glass . Tip: You can also buy up to 80 Seaweed per day from Arhein in Catherby for 2gp each. If you've completed Part 4 of Recipe for Disaster, you can also dive for Kelp in the area you discovered during the quest. This can be cooked on a range just like Seaweed to make Soda Ash. Bullseye Lantern: make a Bullseye Lens and Smith a Bullseye Lantern. Use the Lens with the Lantern to complete it. Battlestaffs are useful weapons in RuneScape because once equipped, it takes the place of an elemental Rune. If you enchant one, its power and attack will increase and it will become stronger. A regular Battlestaff available from the Varrock Staff Shop or Yanille Magic Guild for 7,000gp. Once you've got everything together, you're about ready to start making a Battle Staff. Decide what kind you want, but remember that at level 56 you can only make a Battle Staff of Water. Take the staff and orb to the correct Obelisk and cast the charge spell on it, which will charge the orb. Once you've charged the orb for your Battle Staff, it's time to craft it onto the staff itself by using the orb with the staff. You can have it enchanted by Thormac the Sorcerer, provided you have already done the Scorpion Catcher Quest. To have him enchant it, you need to pay a nominal fee of just 40,000gp. Snail Shell Helms, or Snelms, can be crafted by Members after they have finished the Priest in Peril Quest. Snails can be found in the Mort Myre Swamp, and once you kill one pick up its shell and use a Chisel with it. You need at least 15 Crafting to cut the shell, and you'll get 32.5xp for cutting each shell. For more info about Snelms, check out the Snail Shell Helm Guide. During the Shades of Mort'ton Quest, Members need to rebuild the nearby temple using Limestone Bricks (among other materials). You can cut Limestone into Bricks by using a Chisel, and you'll receive 6xp. Limestone can be mined from the Limestone Mine northeast of Varrock, or bought in the Shop in Mort'ton. For repairing the temple, you'll get 5 Crafting experience each time you repair a part of it. Check out the Shades of Mort'ton Quest guide for more info. During the Lunar Diplomacy Quest, you'll be able to make the Lunar Ceremonial Outfit. Each piece requires one Suqah Hide, and you'll need level 61 crafting to make the full set.